The Prosers: Fun with Generators! One of the best parts about being in a writing community, wherever it is that you may find it (and find it you must, or you'll go stark raving mad as a writer because we're such oddballs! It may take a few tries to find one that suits your particular oddball style, but please persevere, your sanity depends on it.) is that within a writing community people make and share the most AMAZING things. Today we're going to have fun with one of those things. First first, I need a visual. In lieu of trying to find an image that actually fits (too hard!) I give you one of Galen Dara's awesome pieces. I met her at World Fantasy Con 2014 and she's fabulous. 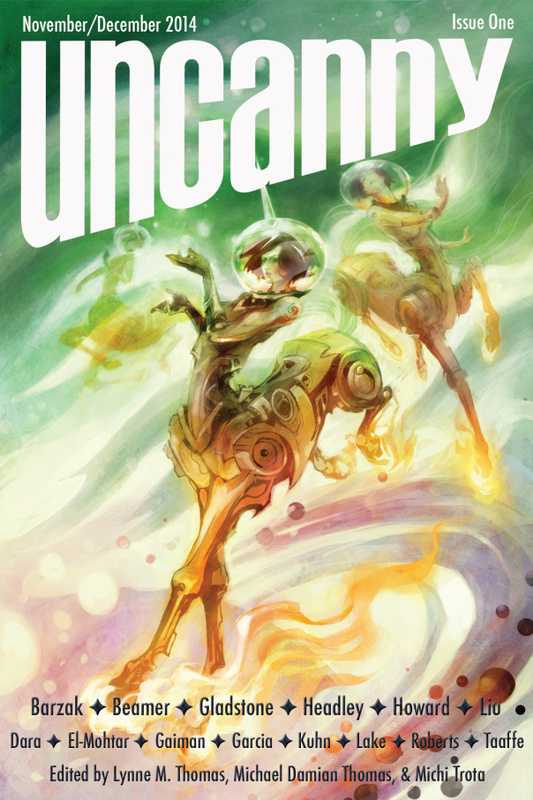 And I'm left to wonder if she ever did get that awesome tattoo that we discussed...but never mind that, enjoy her beautiful space unicorn art (also the cover of Uncanny Magazine's first issue) and if you really like her work go buy one of Galen Dara's art prints on Etsy! Since then, Mary has taught numerous other classes and created an alumni group from all of her classes. The group numbers over 200 by now! And in that alumni group, I met Kate, a fellow writer who has created a few different generators just for fun. A reliable woman with a cynical outlook on life. Constantly wants help with even the simplest tasks. Takes practical jokes very poorly. Thinks up elaborate solutions then discards them for being too easily seen through. Pathological liar: lies even when he doesn't want to, or doesn't intend to. At least ten minutes late to any appointment. Picky sleeper; cannot sleep on the floor, or near-floor level. Often gets sick from overeating. Okay, okay, so I have a character. A little heavy and short. Maybe older. What's her backstory? Have no fear, use the Character Backstory Generator to figure out this char's relationship to the protagonist and more! Well that's great. How about a Belief System? What's common in this world? There's a Belief System Generator as well. The system is polytheistic. The divine follows a familial model.Origin myth: The world was created when land emerged from the waters, and humans were made from fallen deities. It is heresy to say humans were made from mud, or from the divine. Other generators related to language and country/geo-political factors exist. And Kate adds to this as she finds other things of interest to her and of possible interest to other writers. So go have some fun with these generators! Share your results in the comments! Generated: A impulsive woman with a realistic outlook on life. (I love this because realists are usually seen as orderly. What a fun juxtaposition) These are entertaining generators. Thanks for letting me know about them. Brilliant!